Diving right into my new Tirol selection, I'll start with this mini variety pack. 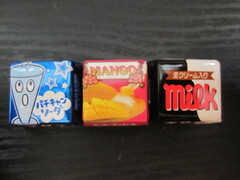 Of the 3 flavors, 2 are new to me: Mango and Pachi-Can (popping candy) Soda. 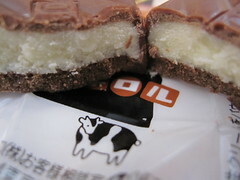 Milk is a classic Tirol flavor that I've had many times before but never reviewed. 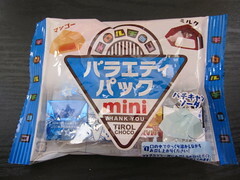 I'm not sure why the bag says Thank You, but I guess it's Tirol's way of thanking anyone who purchases their products. Well, Tirol is most certainly welcome (though I can't really accept their thanks, since this was a gift), and the brand has such a good track record that I'd like to thank Tirol, too. 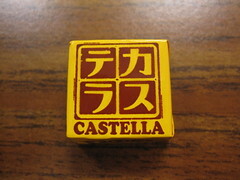 Before college, I studied the French language for 5 years, but at the end of high school, I started studying Japanese. At university, I focused on Japanese and forgot nearly all of my French. Recently, I started taking a French class at a local club, and I am enjoying the challenge. My stepmother-in-law is also taking French with the same club, and for Christmas dinner last year, she and my father-in-law were inspired to make Buche de Noel for dessert. It was delicious (especially since they carved a little knot in the frosting to make it look extra log-like), so when I placed my last napaJapan order, I had to try Buche de Noel chocolate. 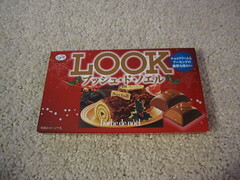 I was once wary of LOOK chocolates (I had some matcha LOOK a few years ago and was not impressed), but after reading a review at Sweets Blog, I decided to give them another chance, and I'm so glad I did! The Buche de Noel pieces were coated in sweet, milky, and slightly cool chocolate, and they had truffle-like centers. 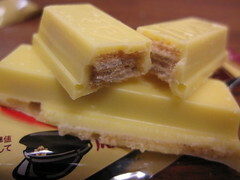 Rather than cake, there were tiny bits of wafer in that truffle-ish filling, and the wafers added both a subtle almond flavor and a light crunchy texture. 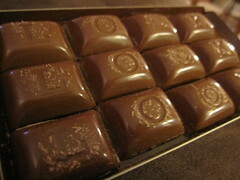 I could taste vanilla as well, and though sweeter than the Buche de Noel my in-laws made, the chocolates were delicious. I wish I had given this brand another look sooner! 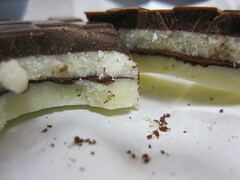 Rum is often paired with confections, making for some very boozy treats. As a goody-goody child, I was wary of rum balls that smelled too strongly of alcohol - they were for grown-ups. These days, I love boozy chocolates, though I am partial to bourbon balls. It's been way too long, Rebecca Ruth. 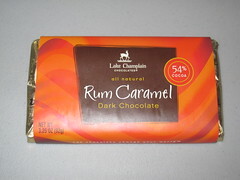 I bought this Lake Champlain chocolate bar at a local fancy grocer around Christmas time (while making a gift basket for my in-laws) since I had heard good things about the brand. It was between $3 and $4 US, but I don't remember the exact price. The bar had hints of a liquor scent that reminded me of rum. The gorgeous, almost too perfect-looking dark chocolate had such a strong snap that it was hard to break the bar cleanly. However, the chocolate was decadent and slow-melting. 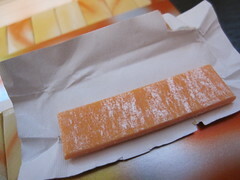 The sticky rum caramel oozed out from the pods and had a wonderful burnt sugar flavor (though I couldn't taste rum). 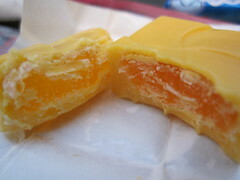 It was very rich and had a great consistency - not too runny but not firm. 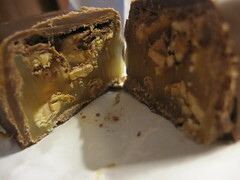 The chocolate had a clean, slightly bitter finish, which was a delicious match for the decadent caramel. 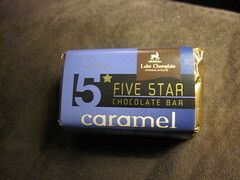 This bar certainly piqued my curiosity about the brand, so I have since picked up three of Lake Champlain's 5 Star Chocolate Bars (reviews coming soon). Sukiyaki is one of my favorite Japanese dishes. The sweet, earthy sauce goes perfectly with all the ingredients that simmer in it. I love the tofu, the enoki mushrooms, and, though I'm not a big beef eater, the delicate, paper-thin slices of marbled beef. It's not too tricky to make, either! I also love Cheetos. They were my late Grandpa's favorite snack, so I always remember him when I eat them. 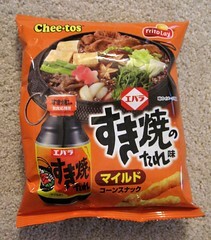 So, if sukiyaki is good, and Cheetos are good, then Sukiyaki Cheetos must be good, right? When I saw them on napaJapan, I knew I had to get them. After reading reviews of things like Smoked Fresh Ham and Mascarpone Cheese Pizza Doritos on Food Junk, how could I resist a Japanese take on an American snack classic? If I didn't see the word Cheetos in the corner of the bag, I never would have guessed what these were. 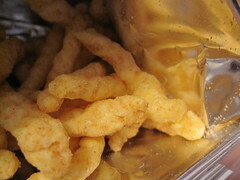 The open bag smelled like sukiyaki - toasty soy sauce with a subtle sweetness. 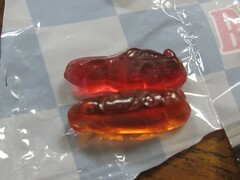 The Cheetos had a tart and savory flavor, mostly soy sauce with a hint of fruitiness, a subtle fishiness, and sweet beef. The crunch was just like regular cheese Cheetos, but cheese powder was not among the ingredients (however, various meats and fish powders were). Although I wasn't a huge fan of the initial punch or the aftertaste, the middle range was good and they were certainly edible. My husband liked them more than I did, but I don't think I'll be buying them again. As a savory snack accompaniment to beer, they'd probably do all right, but later today when I'm using the Superbowl as an excuse to eat unhealthy snacks, I think I'll leave the rest for my husband. My love affair with Meltykiss goes back years. I can't remember exactly when I first tried them, but I've tried so many varieties that I've come to consider them a sure thing. New flavors therefore must be sampled. 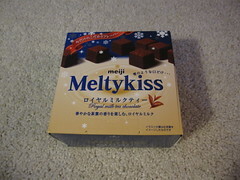 This winter, Meiji brought out Royal Milk Tea Meltykiss, which doesn't seem to be a re-release. I purchased my box from napaJapan for $4.99, which is 50 to 70 cents more than other flavors, suggesting this could be rare (or popular) even among limited edition flavors. 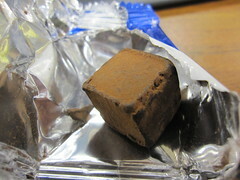 The cubes were wrapped in a lovely bold metallic blue, and had the signature Meltykiss dusting of cocoa powder. They smelled bitter and a bit floral (much like milk tea). Initially, the cocoa powder seemed extra bitter, but it's been a while since I've had Meltykiss, so my memory could be failing me. The chocolate reminded me of Earl Grey tea, and though it tasted like bottled royal milk tea mixed with hot cocoa, it was missing that rich heavy cream note. 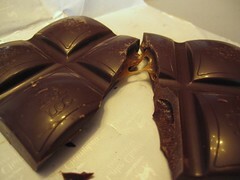 Of course, the chocoalte had that signature Meltykiss meltaway texture. Despite the lack of heavy cream, this was a very tasty flavor, and if it was available locally, I'd certainly buy them again. 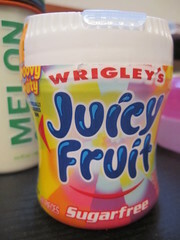 In keeping with that gum theme, I bought myself this cute little cup of Juicy Fruit Groovy Fruity because I was attracted to the funky, colorful packaging. Despite nostalgic jingles about the moving taste of Juicy Fruit, I was never a big fan, simply because I couldn't really tell exactly which fruit it was supposed to taste like. Well, neither of the two flavors in Groovy Fruity were well identified, either. They didn't taste like the original, vaguely tropical Juicy Fruit. Since I'm not sure what the two flavors were, I'll go by color: white and red. In my cup, there seemed to be more white than red. 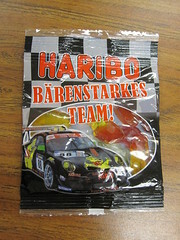 The red pieces had an artificial cherry-like flavor, so what I'm really saying is that they tasted red. 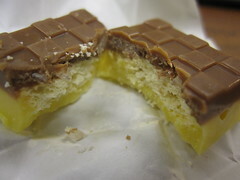 The tabs were firm at first, but they softened as the crunchy shell dissolved. Red was sweet, juicy, and just a tiny bit tart. 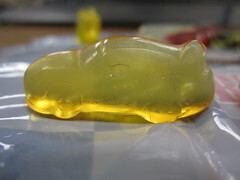 It wasn't minty but did have a slight cooling effect. The flavor lasted five minutes or so before becoming a dull hint of fruity sweetness. 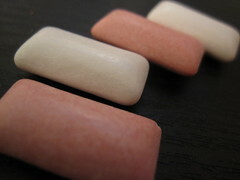 At this point, the gum had a firmer, denser chew than I prefer. The white tabs were a little more like the original Juicy Fruit, only with a very strong minty flavor and intense cooling effect. These chewed softer than the red gum, but didn't taste as fruity. The flavor was longer lasting, but neither flavor was all that good. I still like the container, but I wouldn't buy this again. Cinnamon is the last of the three flavors of Vitamingum Fresh samples that the kind people at Vitaball, Inc. sent for me to try. I definitely enjoyed Spearmint and Peppermint. Most of my cinnamon gum memories are associated with classic Dentyne, since it was my mom's favorite for most of my childhood. My dad liked Doublemint, and I used to wrap a piece of Doublemint around a stick of Dentyne for a cinnamint flavor. 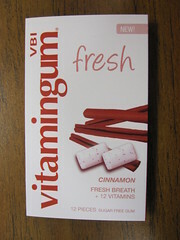 Vitamingum Cinnamon was a straight cinnamon flavor with a strong, spicy punch (hotter than classic Dentyne). It was a nice, caffiene-free jolt in the morning! 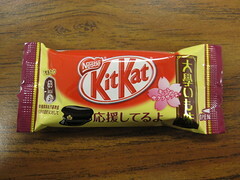 It lost its intial intense flavor faster than the two mint gums, but the remaining flavor wasn't bad. 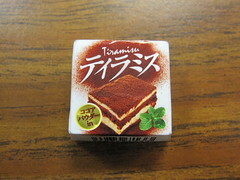 Like the other two flavors of Vitamingum, Cinnamon had a good texture that chewed neither too hard nor too soft. 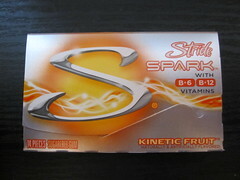 Simply because of personal flavor preference, I didn't like this one as much as the Spearmint, but it was still a very good gum, and not just for a niche market. Like many other residents of the Midwest, USA, I was snowed in yesterday. This would have been the perfect time to catch up on some blogging, right? Although I had the motivation to work from home (I kind of have to, since I'm salaried), I never got around to blogging. Did anyone else get snowed in? 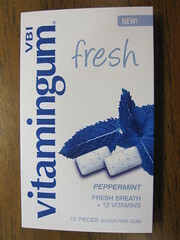 In case you didn't catch my recent review of Vitamingum Fresh Spearmint, Vitaball, Inc. kindly sent me samples of three flavors of Vitamingum Fresh. Today, let's look at Peppermint. 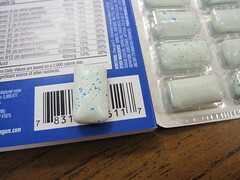 The packaging was nearly identical to the Spearmint flavor, only with oddly bright blue mint leaves for color consistency. Like the Spearmint, Peppermint had a strong minty burst, and a thoroughly chilled, fresh flavor. 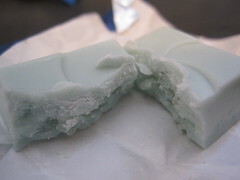 Again, it was an excellent breath freshener, though I prefer spearmint to plain mint. The texture was bouncy and not too hard or too soft, and the minty flavor, somewhat subdued after the initial intensity, lasted well over 20 minutes. 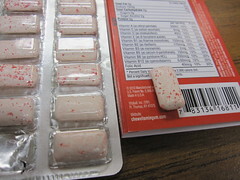 I'm still not a vitamin taker, and I don't know if this gum will change that, but I was pleasantly surprised that Peppermint (and Spearmint) Vitamingum is a good gum and not just a multivitamin.